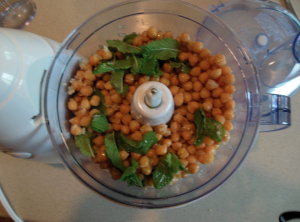 Humus – Who Knew it Was so Delicious?!! I think we have a new favorite snack around here!! And, it is actually healthy!!! 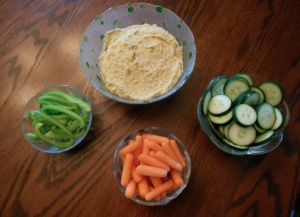 The other night, Chris and I had some humus as one of the courses in our anniversary dinner. We talked to the owner of the restaurant while we ate our dessert and he gave me some of the info for the recipe so I made my version for our Memorial Day BBQ. Pulse until smooth, adding olive oil as needed. 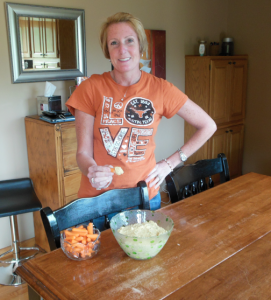 Serve with fresh veggies – we used baby carrots, green pepper slices and sliced cucumber. I stole a sample before our friends came over: I can’t believe that I’ve never made this – so good!!! 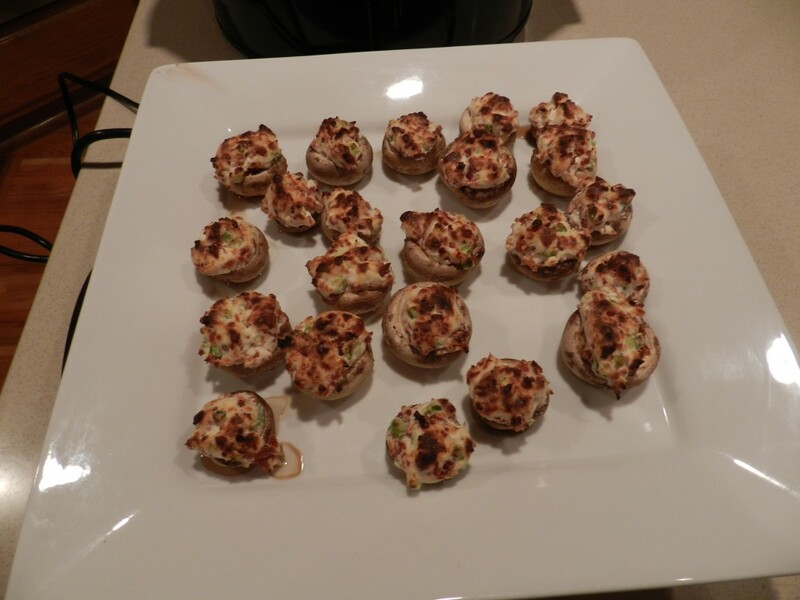 I used to think that making stuffed mushrooms was only for “fancy” cooks!! Who knew they were so easy to make?! Pop the stems out of the mushrooms. Clean the mushrooms set on oven proof platter. Mix the cream cheese, bacon, onion and garlic. Fill each mushroom. Broil for about 4-6 minutes (till cheese begins to brown). 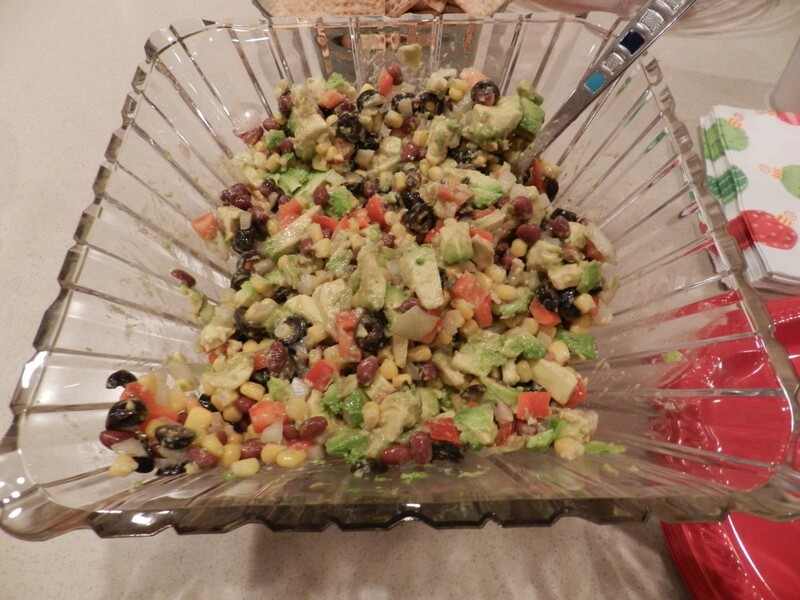 Combine corn, olives, beans, red pepper and onion in a large bowl. 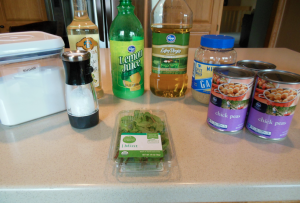 Mix garlic, oil, lemon juice, vinegar, oregano, salt and pepper in a small bowl. Pour over corn mixture and stir well. Cover and refrigerate. Just before serving, chop avocados and stir into salsa.